It's already known to the musical industry, since about 25～30 years ago, Chinese origin stringed instruments have becoming more and more important to the world, not only by quantity, but also by their improving higher quality. Among all the Chinese instrument makers, how can bow makers improve skills to top master standard so fast? First of all, bow making skills is no longer a secret since 200 years ago. It has been taught in professional schools for a long time. 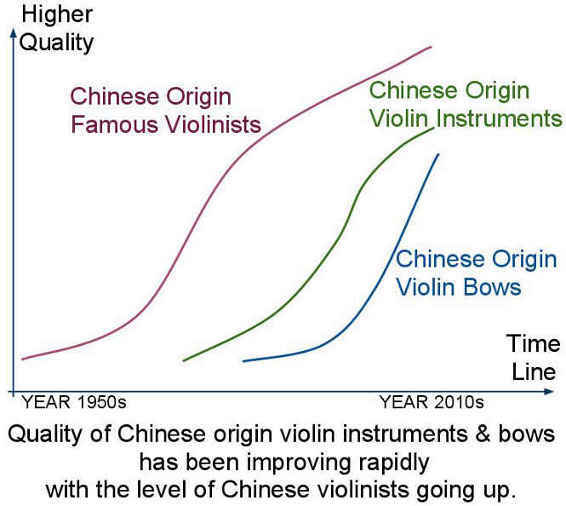 Secondly, western violins and bows have already been imported into China in early 19th. In China, we can see the improvements of classical instruments are greater than "pop" instruments, especially with strings and pianos. It also explains why there's so many well-known Chinese violinist and pianist while there's a few famous Chinese guitarist or drummer. It's the same situation with the instrument makers. Thirdly, professional instrument importers from the western world have helped greatly while placing huge orders to our makers these decades. They brought new skills and technologies to us, these all help us improving greatly. And in some way, Violin & Bow makers becomes more skilful than piano makers for a simple reason, it cost much less to build a bow than a piano. The quality/price of Chinese origin violins and bows has been recognized by wholesalers, dealers. But we do have difficulties to explain to players of our quality. The truth is some of Chinese low-level bow makers are making and selling poor quality bows, and nearly all of us didn't have branded bows at all, neither do we put on our own workshop names for the market to recognize high quality from low quality. 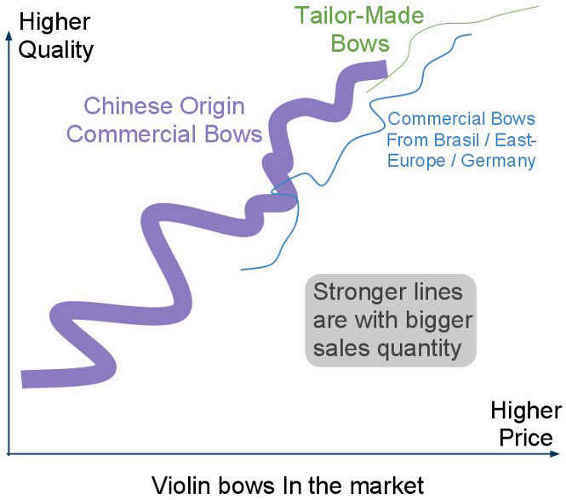 For this reason, dealers are also having big problems of distinguishing bows under one big trade mark "Chinese bows".